Home › Cosmetic Dentistry › When Did Dental Implant Dentistry Begin? 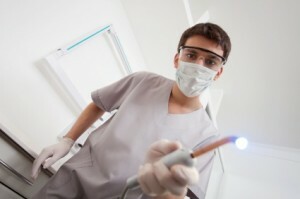 When Did Dental Implant Dentistry Begin? The procedure that your Brentwood cosmetic dentist performs to replace teeth has come a long way from its primitive beginnings. Dental implants date back as far as 600 AD among the Mayan culture in South America. Back then, shells, ivory, and animal bones were pounded into the jaw to try and replicate the look and function of a missing tooth. Thankfully, your dental implants dentist has more advanced tools to work with today. As early as the 1700s and 1800s people began experimenting with tooth replacement using bone from human donors. This quickly failed when negative reactions occurred in patients’ immune systems. Although several metals were unsuccessfully tried over the next several years, it wasn’t until the 1950s that the first glimpse of modern-day dental implants came about. A Swedish researcher discovered the remarkable compatibility of bone and titanium, the material that your dental implants dentist uses today. For the next 30 years researchers experimented with fusing titanium and bone together, and the 1980s brought about the first formal introduction of dental implant dentistry. As time goes on, new advancements and technology continue to revolutionize dental implant dentistry. Some dental implants dentists have begun using special technology that allows them to place your dental implant in a day instead of over several weeks. Ask your Brentwood cosmetic dentist Dr. Dennis Wells what systems and technology are available for your procedure. To schedule an implants consultation with Dr. Dennis Wells, call Nashville Center For Aesthetic Dentistry at 615-371-8878.